Anticorrosion properties an a chromate-free basis. 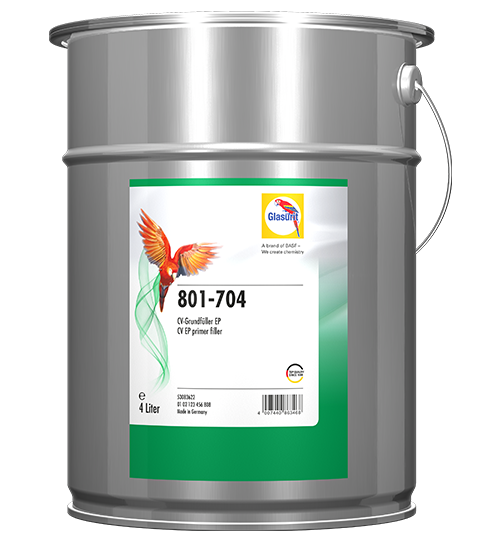 Good anticorrosion properties can also be brought about without chromate – as is demonstrated by Glasurit 801-704 CV Epoxy Primer Filler chromate free. In the three-layer system, this chromate-free primer provides high-quality vehicles of composite design with reliable protection against corrosion. This chromate-free epoxy primer filler is the ideal basis for original finishing of high-quality vehicles – except for ones with aluminium substrates. It withstands chemical attack, is moisture-proof, and is consequently specially suited for use on vehicles whose surfaces pose special requirements, such as galvanised fire-fighting vehicles. In visual terms too, 801-704 impresses with a high-quality finish. The chromate-free epoxy primer filler generates its good anticorrosion properties in the three-layer system, and also in a primer filler/topcoat system following a meticulous pretreatment stage. The chromate-free base filler in the three-layer construction as well as in the two-layer construction unfolds its high corrosion protection after careful pretreatment.